H-5GUI system, Vale of the Silent region. On the 18th of November at 21:00 EVE Standard Time, forces belonging to Northern Coalition. [NC] clashed with The Imperium over the infrastructure hub in the system. Northern Coalition. [NC] forces had deployed to the Geminate region, harassing the local Imperium alliances and reinforcing infrastructure in order to provoke fights. One such attempt in the border system of H-5GUI in Vale of the Silent had prompted Get Off My Lawn [LAWN] and The Bastion [BSTN] to react, as Northern Coalition. forces were reinforcing the infrastructure hub of the system. The Imperium brought a Zealot heavy assault cruiser fleet and a Proteus strategic cruiser fleet, estimated at 180 pilots total. The two fleets entered the system quickly and locked it down, attempting to destroy the Northern Coalition. Entosis link ship. Northern Coalition. 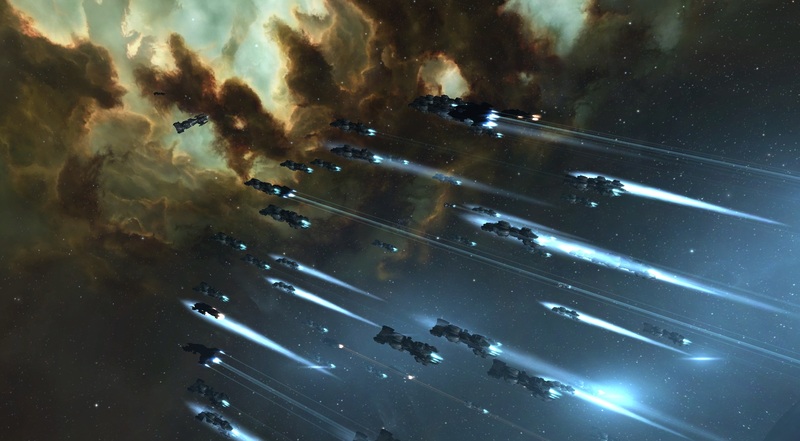 forces expected a retaliation and chose to assemble a 120 pilot Ishtar heavy assault cruiser fleet, but seeing the Imperium’s response fleets switched to a Proteus fleet as well. Once re-shipped, the force bridged into the system on the infrastructure hub, prompting the Imperium fleets to warp to the infrastructure hub grid. For a few minutes the two sides re-positioned on the grid before finally engaging at a perch above the infrastructure hub itself, starting the actual battle. The battle proved a close range and brutal struggle as both sides focused on each others’ logistics wing. Guardian and Oneiros logistics cruisers were quickly annihilated as the Proteus fleets slugged it out. As the logistics wings pulled range and attempted to stabilize themselves the Imperium lit a cynosural beacon and brought in three triage Archon carriers to help tank the damage. However, when the first carrier entered its triage cycle it was promptly targeted and dispatched, the Armageddon battleships the Northern Coalition. force had brought applying heavy neutralizers which simply drained its capacitor and shut it down. At the same time Northern Coalition. lit its own cynosural beacon and jumped in a triage carrier as well, prompting the Imperium to bring two Naglfar dreadnoughts to the field in order to remove it. While the Northern Coalition. triage carrier could do little to tank the damage coming from both the Imperium fleets and the dreadnoughts and was destroyed, the Northern Coalition. fleet had managed to stabilize. This allowed it to focus on the enemy Proteus fleet which simply melted. In rapid succession, Imperium strategic cruisers were torn apart, their logistics wing unable to cope with the damage. The two remaining Imperium carriers did not go into triage mode, possibly afraid of being simply annihilated by the Northern Coalition. fleet which remained close to them. Losing ships fast, Imperium fleets disengaged, warping to a safe tower in the system and leaving the four remaining capitals stranded on the field to be tackled by Northern Coalition. forces. One by one the capitals were destroyed as Northern Coalition. brought more reinforcements into the system. With the field secured, the infrastructure hub was reinforced as well before Northern Coalition. safely extracted, ending large scale hostilities in the system. Battle report for the H-5GUI system can be found here. All told the battle lasted 30 minutes with the system hosting less than 400 pilots at the peak of the fighting and Time Dilation not reported by any of the combatants. Northern Coalition. lost 26 ships including one carrier and two strategic cruisers for a total of 6.65 billion ISK damage. Imperium forces lost two dreadnoughts, three carriers and 31 strategic cruisers for a total of 39.28 billion ISK damage. What are some excellent and also prominent web sites for blog sites???. Somebody stated that you had to buy a domain name, or your blogs weren’t seen by everybody, is that true? Do you recognize what a domain name is? OTHERWISE do not respond to please. My husband and i have been quite delighted when John managed to finish up his investigation through the ideas he gained out of the web site. It’s not at all simplistic to simply be giving out things which some other people have been making money from. And now we know we have got the writer to give thanks to for this. Those illustrations you made, the simple website menu, the friendships you will make it easier to engender – it’s got everything sensational, and it is assisting our son in addition to our family believe that that topic is excellent, and that’s very indispensable. Thanks for all the pieces! I¡¦ll right away grasp your rss feed as I can not in finding your e-mail subscription hyperlink or newsletter service. Do you have any? Please permit me recognise in order that I may subscribe. Thanks. Hi, i have a cost-free wordpress blog site. I have added the widgets that are available in the widget area. But just how do i include widgets that are from 3rd parties such as clustrmaps? If complimentary wordpress blogs don’t allow that, which complimentary blog service allows that?.